Hopper, the coder, from the ‘Secret Coders’ series. It has been a long time since I read a graphic novel with superheroes. But this slim volume, titled Secret Coders, came with a solid recommendation and is written by the recipient of a MacArthur “Genius" Grant. Out of curiosity, I decided to give it a try. It’s the story of a 12-year-old girl named Hopper who has been forced by her mother to shift to a new school called the Stately House. She thinks there’s something weird happening in the school: Its buildings look haunted, the birds on the trees have four eyes, the principal yells at the students, and the janitor gives her the creeps. As for the boys, she finds them “jerk-faces". But then she meets Eni, a boy her age who wonders why her earrings are shaped like sevens. They are both nerds, become good friends and hang out together. Like Hopper, Eni too suspects that there’s something strange happening in the school: Why do the birds have four eyes? Why is the number of a building written behind the door and not outside? Why do the walls of the school have the number 9 written on them? With another classmate, they decide to investigate. But it’s not easy to go snooping behind locked doors because the scary Mr Bee, the school’s janitor, doesn’t like children, particularly the overly inquisitive types. Hopper and Eni are certain Mr Bee is hiding a secret somewhere behind those locked doors. 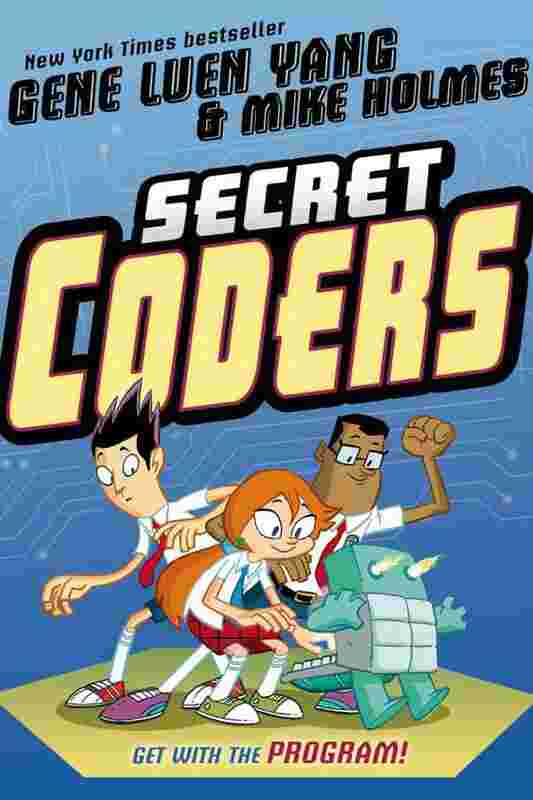 Secret Coders has no magic wands; its superheroes are computer geeks and use programming language to look for clues scattered around the school. The birds are robots, and the cute little turtle they find in the janitor’s closet is also a robot with a keyboard hidden in its shell. Eni the coder explains to Hopper: “The eyes of the birds display binary numbers…binary is how computers store numbers…they are like switches that go off and on." He teaches her how she can figure out the number each bird represents just by looking at its eyes and whether they are open or shut. In the process, as they solve one puzzle at a time, they also teach the reader how to code (the basics of computer programming). I don’t know how to code (I have made several attempts online but don’t have the discipline to carry on), but, after reading Secret Coders (it’s just 82 pages), I can quite imagine how it makes coding fun for a school student. The graphic novel is the brainchild of Gene Luen Yang, a Chinese-American cartoonist and writer who majored in computer science from the University of California, Berkeley, and then began teaching at a high school. He is also a MacArthur Fellow. Yang and illustrator Mike Holmes created Secret Coders in 2015 and released the fourth volume in the series, Secret Coders: Robots & Repeats, two months ago (all available on Amazon India). Yang calls it a “graphic novel series for computer nerds". He named the main character “Hopper" as a tribute to Grace Murray Hopper, a pioneer in computer programming. Hopper and Eni use a coding language called Logo that is quite old, and while it was developed especially for children, it is no longer very popular. My son tells me that he was taught Logo in junior school some 20 years ago. There are several other, more recent coding languages—such as Scratch, developed by the Massachusetts Institute of Technology—that have replaced Logo. Yang told Wired magazine that he uses Logo in the book because it’s “designed to create visual images". In a video on his website (Secret-coders.com), he says, “Nowadays, some people think Logo is old and out of date...but it’s a really powerful language capable of lots of stuff." Logo appeals to very young children because they can use it to learn to draw things. A young reader new to coding can replicate on a computer screen what the three curious children do in the graphic novel by using the same language. The author has a website where readers can learn how to code and also download activities. There’s another website called Turtle Academy (Turtleacademy.com) that teaches coding with Logo. I’ve read only the first volume in the series, and it ends rather abruptly. But still, Secret Coders is a fun graphic novel that could be a good resource for beginners who are intimidated by programming. Shekhar Bhatia is a science buff and a geek at heart.